Carp anglers commonly use expensive handheld GPS devices while fishing on big lakes to save promising spots in the water, allowing them to find spots quickly again while carp fishing. 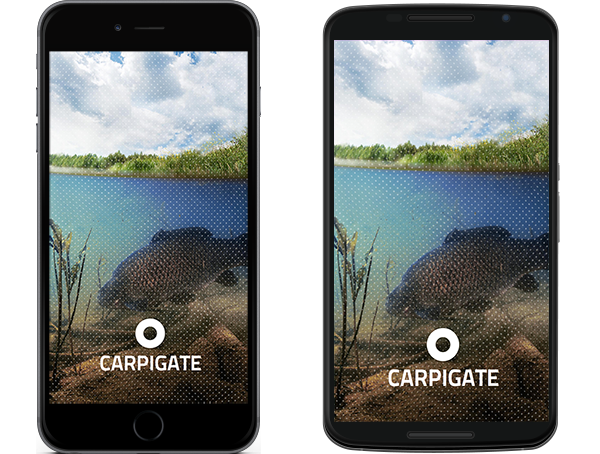 Now, the Carpigate GPS app for your iOS or Android smartphone makes GPS easily accessible and affordable for carp fishing. 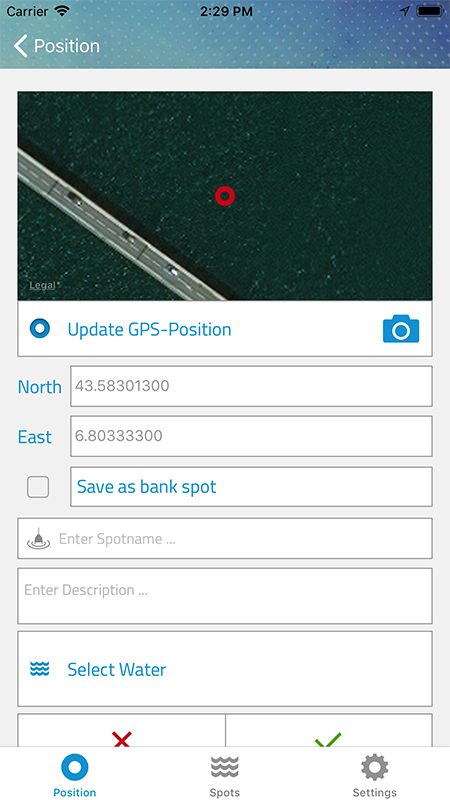 Especially designed for fishing, this GPS app allows you to save and locate GPS position points and coordinates of your fishing hot spots via the GPS functionality of your iPhone or Android smartphone. 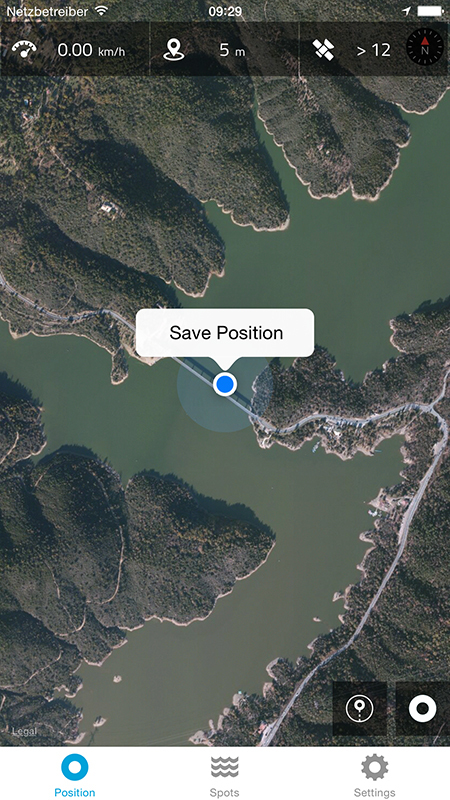 This app easily navigates you back to your saved hotspot, allowing you to lay your bait in the exact location of a previous bite. When you are nearby your saved spot, you are notified by vibration or tone alarm. 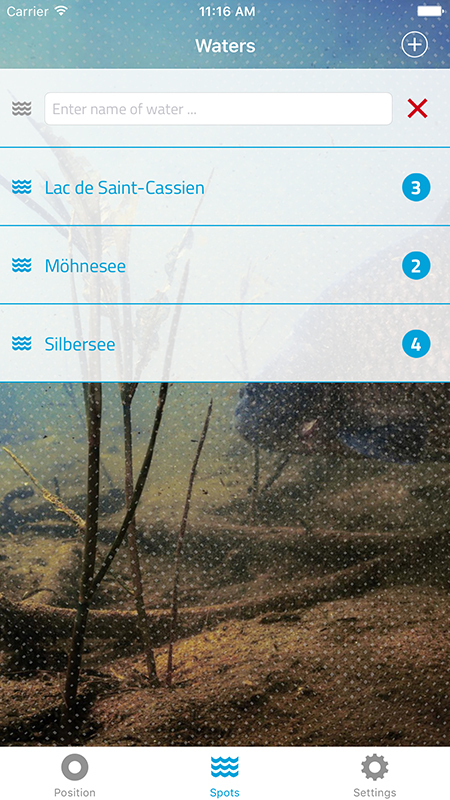 This app ist also fitting well for all anglers who want to be right on the spot when casting. If you have leaded your swim for example with a marker rod, clip your line and count as normal with the help of distance sticks your number of rod lengths. 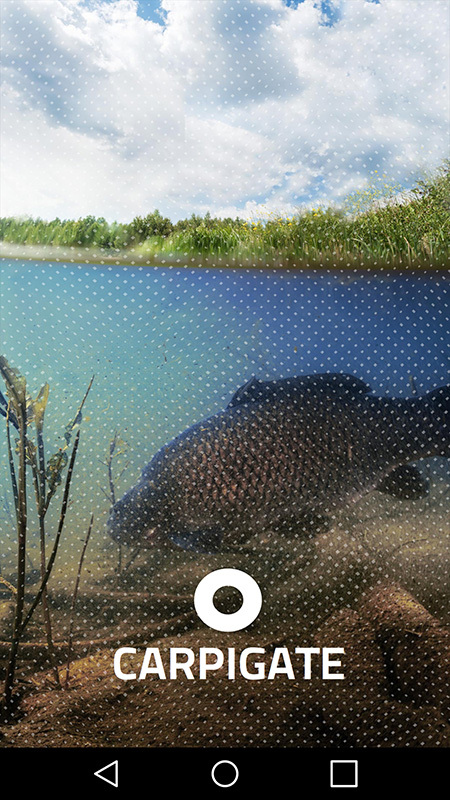 Afterwards go into position, tap on the button for entering your rod lengths and turn your smartphone in the casting direction. From these informations the GPS coordinates of your spot will be calculated which you can save then. 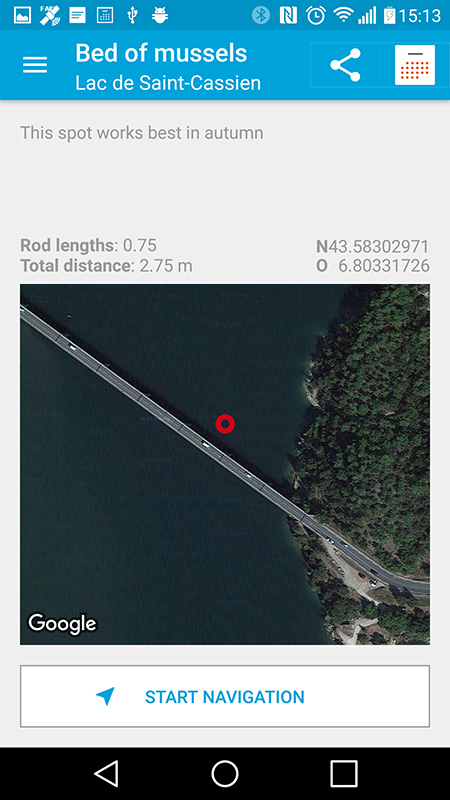 When you cast next time, the direction and the number of rod lengths is shown in the app. Also if you have to cast from another position, always the right direction and number of rod lengths is calculated based on your actual position. 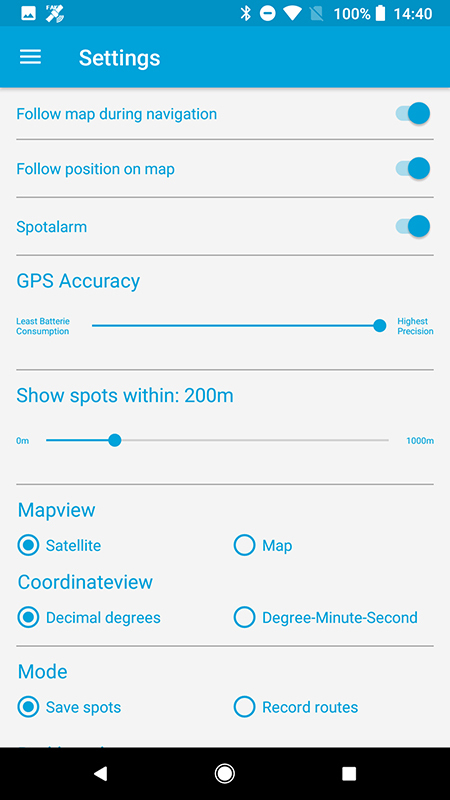 If you also save your camp via GPS, this app can navigate you back to camp at night, during bad weather or when visibility is low on big lakes without the need to set up a light on shore. You can save an unlimited number of waters containing an unlimited number of spots. Use significant names for your spots and add optional annotations for example "works best in autumn." So after years, you will still know if this spot was the plateau, the sloping edge or the bed of mussels. From now on, you can copy all saved data of your spot with one tap and send it to your friends via SMS, E-Mail or Whatsapp. Therefore, you can easily share your feeding grounds and alternate feeding responsibilities with your fellow and be confident that they will be able to find the exact locations. 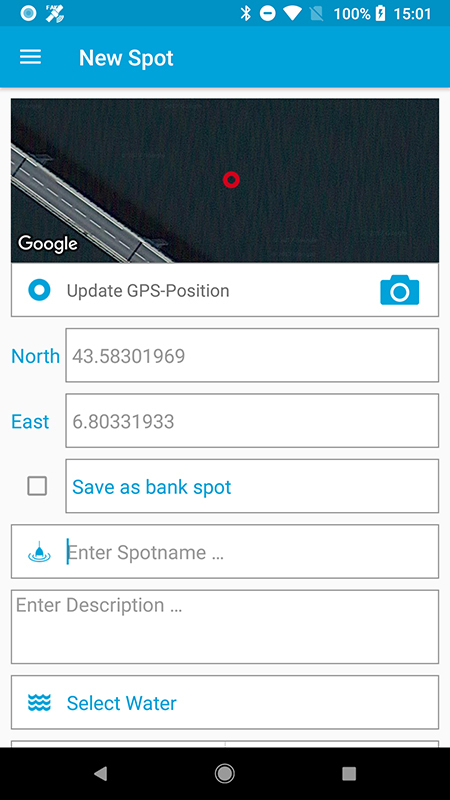 If you investigated your waters via Google Earth or Google Maps, you can now save interesting areas with a longer tap on the map or by entering the coordinates manually. 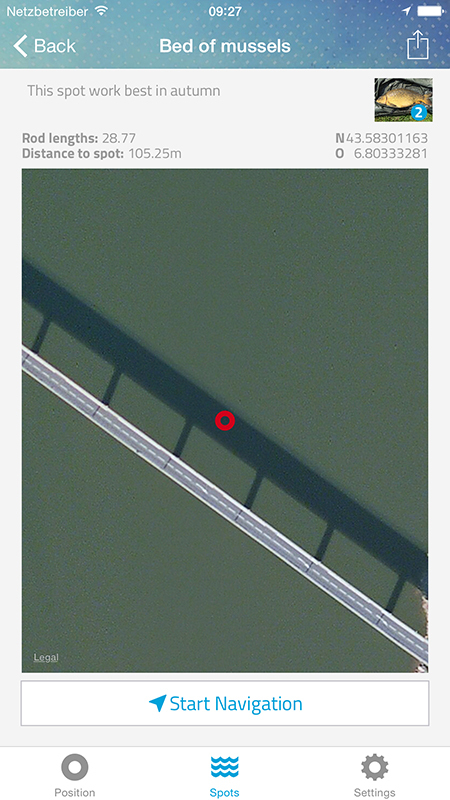 Once on the water, you can easily locate these areas for a more detailed look. Save an unlimited number of pictures to your spots, for example special caught fish, the casting direction, or maybe to highlight an overhanging bush. 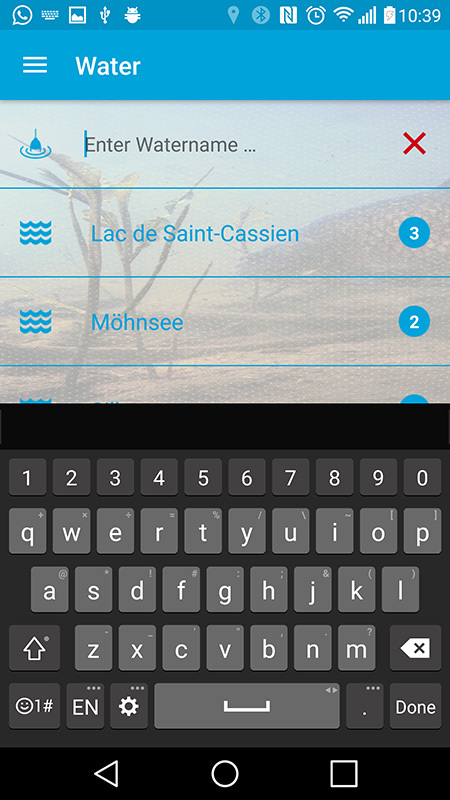 Of course, this app is useful for all boat anglers too. Finally found the location of pikes, zanders or perches while spin fishing or trolling? Use this app to save the hot spot and you will not have to start at the beginning next time. Especially interesting for predator and trolling anglers, you can record complete trolling routes. Likewise, you can also create routes out of your already saved spots and navigate back to them. 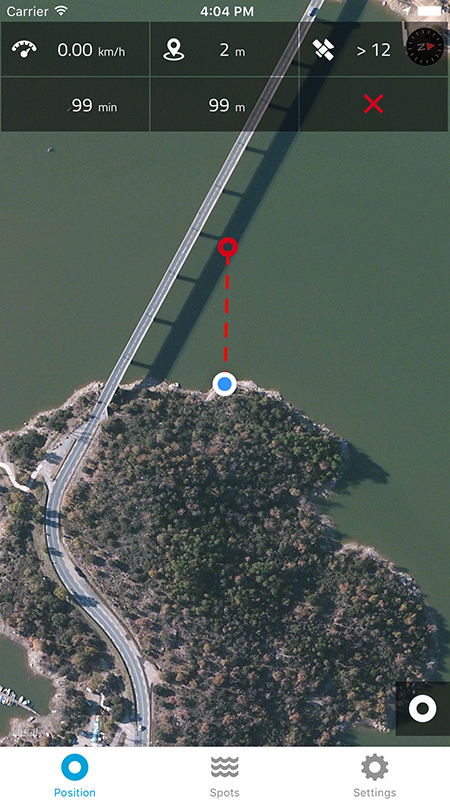 If you drift away from your recorded route, you will be notified by an alarm tone. Special algorithm to reach maximum GPS accuracy. Save an unlimited number of waters. Save an unlimited number of spots for your waters. 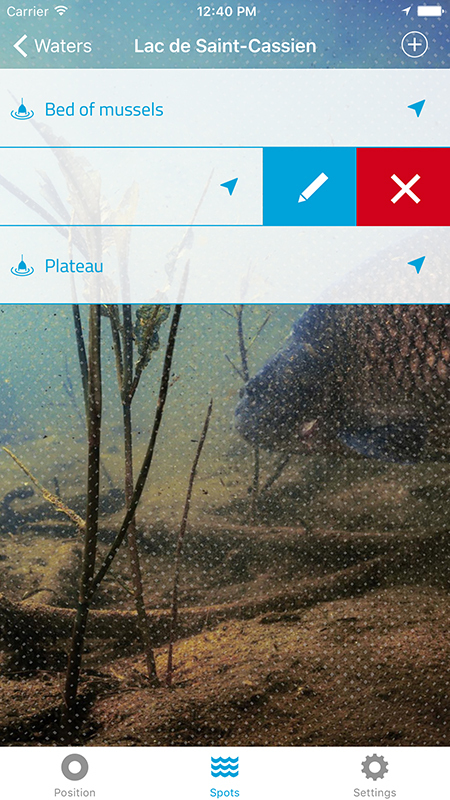 Save spots based on number of rod lengths and casting direction. 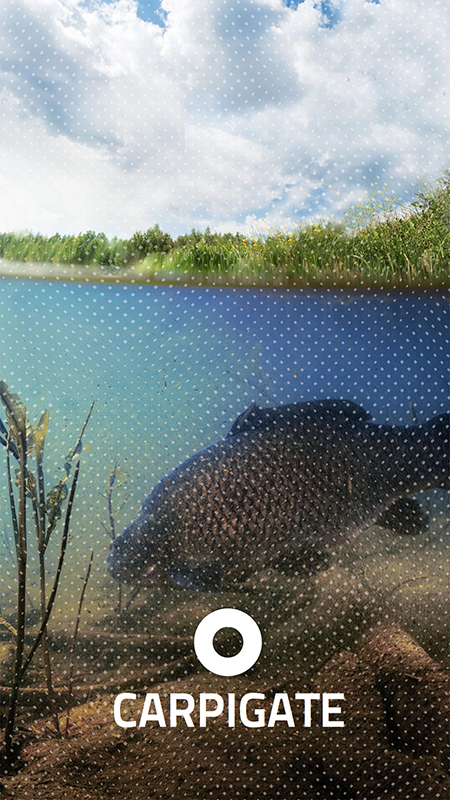 Save special areas or target fish. Share your spots with your fellow. Especially interesting for predator and trolling anglers. 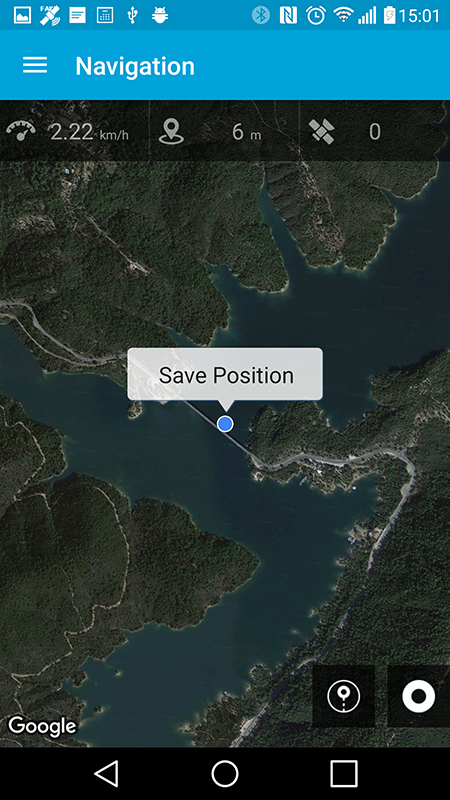 Save spots with a longer tap on the map or enter coordinates manually. 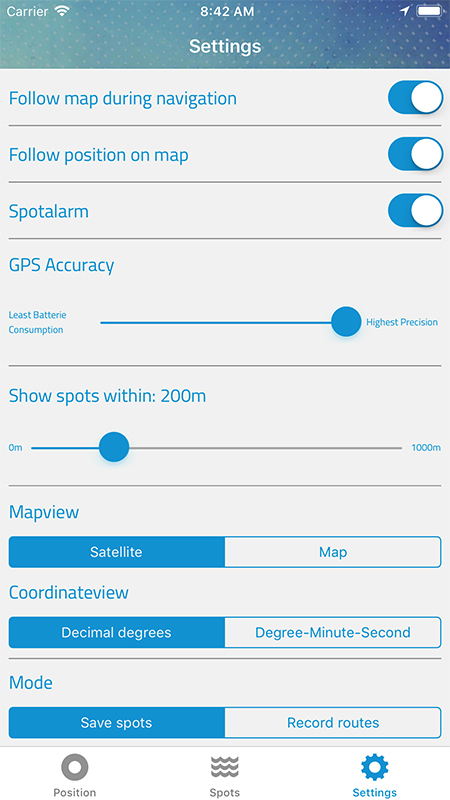 You can see how accurate your GPS signal is at any time. You can see how many satellites are connected. 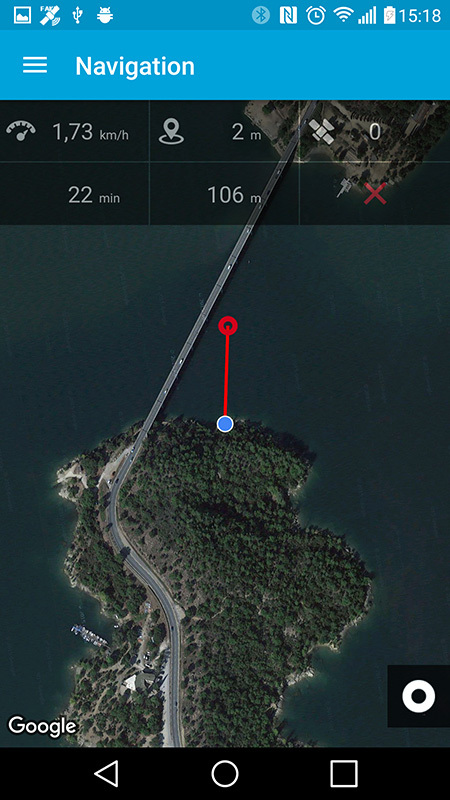 In navigation mode you can see the duration of your navigation. In navigation mode you can see the distance to your spot. You can see how fast your boat is traveling. App rings/vibrates if you are near to your spot. You can switch to battery save mode, if your GPS is good enough. You can choose between two different map views. Here you can find some exclusive screenshots. Here you can download the app for your respective platform. Is the saved database equal for everyone and visible for everybody? Who can see my saved data? Surely you as the developer have diverse possibilities to access the data indirect or direct, but who else? If I install the app and change my smartphone, do I lose the saved data? You can backup your old smartphone with your computer and restore your new smartphone from this backup. This way you keep all your saved data created with this app. However, you can only do this by changing from Android to Android or iPhone to iPhone, not from Android to iPhone or vice versa. Do I have to rebuy the app or would it be ported to the new smartphone? The app purchase is linked to your user account at Google or Apple. You only have to buy this app once on each platform. Do the features work without internet connection? This app is fully useable without internet connection, with the exception of the map feature. The map helps with orientation but is not required for a fully functioning app. Loss of map access does not slow down the app nor limit the functionality. Similarly to common GPS handhelds, the app only requires a GPS-connection, which you have normally on every free area. Is a test version of this app available? No, unfortunately neither Apple nor Google provide an option for developers to release a time restricted test version of an app. 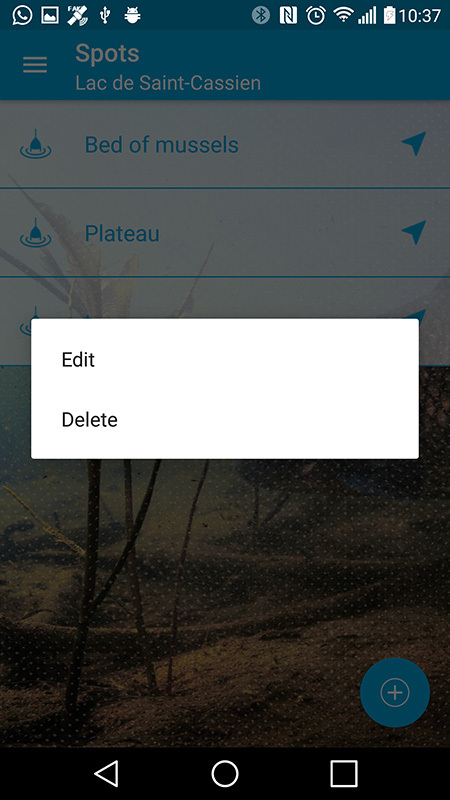 Is the app useable in combination with a baitboat? No, the app has to be on the location you want to save. Maybe in the future some baitboat manufacturer will offer an interface. What are the system requirements for Android smartphones? This app requires a smartphone with bulit-in and fully functional gyroscope or Android version 4.4 and newer. On my Android smartphone the map rotates in wrong direction? Google Play rejects my payment per mobile payments? Please contact Google Play support or your mobile network operator. or even if you found a bug. We’re here to help.